Re: The Chicken or The Egg ? Just because two entities have similar traits does not mean that one derives from the other, or that they are even related. I'm not an expert, but I believe that under "evolution theory", this is called "convergent evolution". "This is known as convergence in the evolutionary world. Two creatures arriving a similar design because it's what's best given the variables of nature, despite being different species. Look at dolphins vs sharks. Sharks have been in the water their entire existence, and dolphins evolved from a four legged land creature. Both ended up arriving at very similar designs despite evolving completely independent of one another. It's speculated that because of this, if we were to find an alien planet with advanced sea life, and assuming they rely on speed to not die/reproduce, it's very likely they'd look similar to Earth's fish. " 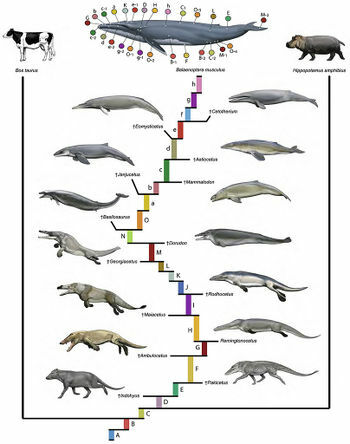 Dolphins evolved from a four legged land creature? I never heard of that, is there proof of that? I believe dolphins have always been dolphins, whales have always been whales, Sharks have always been sharks. Correct. Genetic and fossil evidence all points to that, without any of the evidence being out of order in the fossil record (where the specimens are found around the globe and in what layer of rock). I've been trying to find a concise article that explains it well without being a complete chore to get through. I think this one does a nice job. 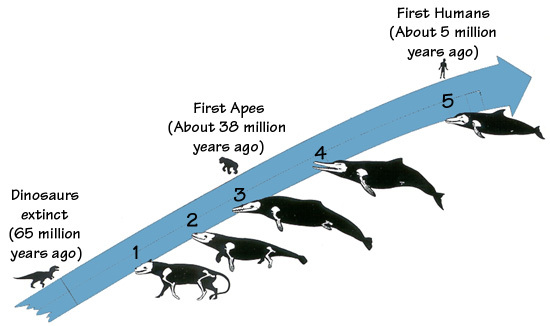 About 95 million years ago Mesonix, the ancestor of today's dolphin, appeared on Earth. It was a terrestrial animal that went into the water to feed. Mesonix had front and hind limbs containing bones to support its weight. It was covred with hair. Over the next 30 million years Mesonix began to become more adapted to life in the water. Perhaps changing environmental conditions on the earth at that time prompted this adjustment in life style. Forelegs became pectoral flippers. (The bone structure in the pectoral fins of today's dolphin is a remnant of its life on land.) Mesonix's hind legs began to disappear. (Today, the dolphin has vestigial hind limbs in the form of rod-shaped pelvic bones, perhaps remnants of hind limbs used for land life.) Its hair disappeared because hairless skin is more hydrodynamic and is not needed to warm an animal living in the water. The Tokyo Institute of Technology recently reported developing a new way to look at an animal’s genetic history using DNA tracking. The DNA sequences they studied were called short interspersed elements, or SINEs, and long interspersed elements, or LINEs. These elements, once found in an animal’s genome do not disappear and will point to its evolutionary origins. The genetic evidence from this technology indicates that dolphins are closely related to cows, antelopes, giraffes, and that pigs may be their closest relatives, as they all have the same SINEs and LINEs. The dolphin’s 3-chambered stomach functions in the same way as the 4-chambered stomach of a cow, perhaps providing additional evidence of this evolutionary link. It's not a coincidence that all mammals, whether land, sea, or air all have similar bone structures. I knew about bat wings and vestigial bones in whales but not in dolphin flippers. That is cool.